Home > Posts tagged "bat for lashes"
Bat For Lashes is the latest act which has performed at Sziget 2013 to have videos uploaded to the official Sziget 2013 YouTube channel. The organizers have uploaded no less than nine separate songs from the Bat For Lashes concert. The uploaded songs are as follows: Horse and I A Wall Glass Lillies The Haunted Man Laura Daniel Travelling Woman Oh Yeah We’ve added links to each one of them, and you can check out Laura below. The official announcement is here and it includes Biffy Clyro, Mika, Regina Spektor and a lot more, as you can see below. Here's the full list: Biffy Clyro Nero live Mika The Cribs Regina Spektor Bat For Lashes Flogging Molly Dub FX Little Boots The Joy Formidable Erol Alkan Booka Shade Gesaffelstein Felix Cartal Donots Hoffmaestro dOP Blaudzun Daily Bread Splendid Rangleklods live Monophona john doe was right again – we got one name right in the speculation list – Biffy Clyro, and the list includes 22 acts. We also got three names we already had – Blaudzun, Daily Bread and Splendid. 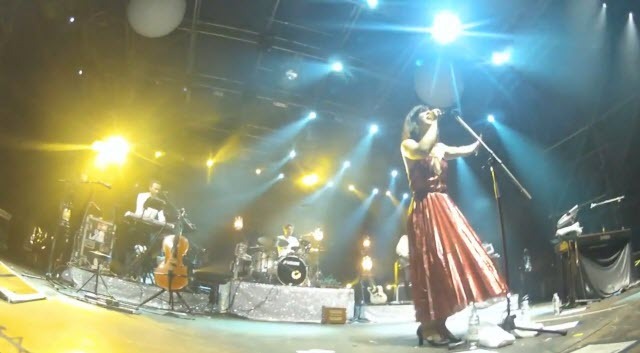 We wrote a while ago, quoting the EMI Hungary site, that Bat For Lashes will perform at Sziget 2012. Since the news article has since disappeared from the label's site, we tried to confirm it with the band. Here's the answer we got: [...] Bat for Lashes currently has no confirmed live dates for 2012 and any official announcements relating to any future dates will be posted on the Bat for Lashes website.[...] Hopefully, a Sziget 2012 date will be confirmed soon. Bat For Lashes – the first name for Sziget Festival 2012! Just as we found out that the first official names for the Sziget 2012 line up will be announced in December (when the sale of tickets will start, too, we have the first name. Bat For Lashes are confirmed for Sziget Festival 2012 on EMI Music Hungary's website.